Signed, lower right. Signed and dated 1997 in marker on reverse. 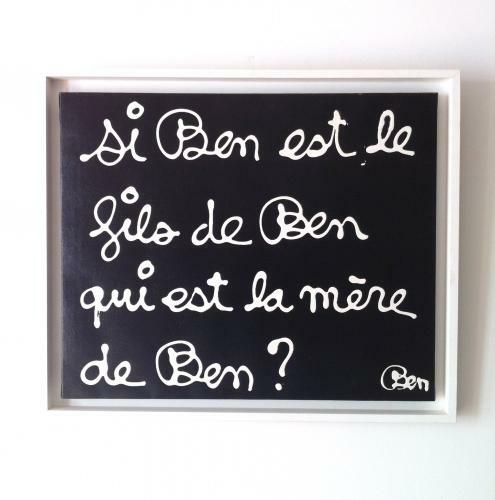 Known simply as Ben, the artist lives and works in Nice, in the South of France. He is known mostly for his text based paintings in white on black. He was an important member of the Fluxus movement, which was considered by many to be the most important radical and experimental art movement of the 1960's. This particular work is a riddle which in French pokes derision at the artist. From living in a gallery window for 15 days (gallery One, London 1962) , to swimming across the Port of Nice, Ben's art was experimental performance with the by product being the hand written signs describing what was happening or every day objects that were signed which transformed them into art works. A follower of Duchamp he believes that anything can be art if an artist says it is. Ben's writing paintings are all a clever comment on art or his place in art, such as 'I am a work of art', Why look?' and 'Art is everything'. In his 80th year, Ben's work has been embraced by the public, his work at one time avant-garde now graces many public buildings, the French city of Nice's tram system and an issue of French postage stamps.